The Stony Brook baseball team’s trip to Albany this weekend ended in disappointment. Two of the team’s games were closely contested, but all three resulted in losses for the Seawolves in a series sweep at the hands of the Great Danes. The Seawolves’ rally fell just short to extend the first game of the series on Friday. Down 5-3 in the ninth inning, sophomore outfielder Chris Hamilton led off the inning with a single through the middle. Hamilton advanced all the way to third base on two wild pitches, and scored on junior outfielder Dylan Resk’s sacrifice fly to center field. The Seawolves couldn’t get any other base runners aboard from there, and lost 5-4. Sophomore starting pitcher Brian Herrmann had a rough outing, allowing eight hits and four runs in four innings. Herrmann quickly got into trouble in the first inning, surrendering a leadoff single to Albany junior infielder Travis Collins. Herrmann retired the next two batters, but Albany junior infielder Matt Codispoti roped a double to center, scoring Collins. Junior infielder Patrick Lagravinese followed up with a single to score Codispoti and put Albany up 2-0. The Seawolves scored their initial runs all in the third inning. Junior infielder Brandon Janofsky worked a one-out walk, and advanced to third on a single from sophomore infielder Nick Grande. Freshman catcher John Tuccillo lifted a sacrifice fly to left field to score Janofsky, and sophomore outfielder Michael Wilson singled in the next at-bat, scoring Grande. Wilson later came home on a wild pitch to give Stony Brook a 3-2 lead. 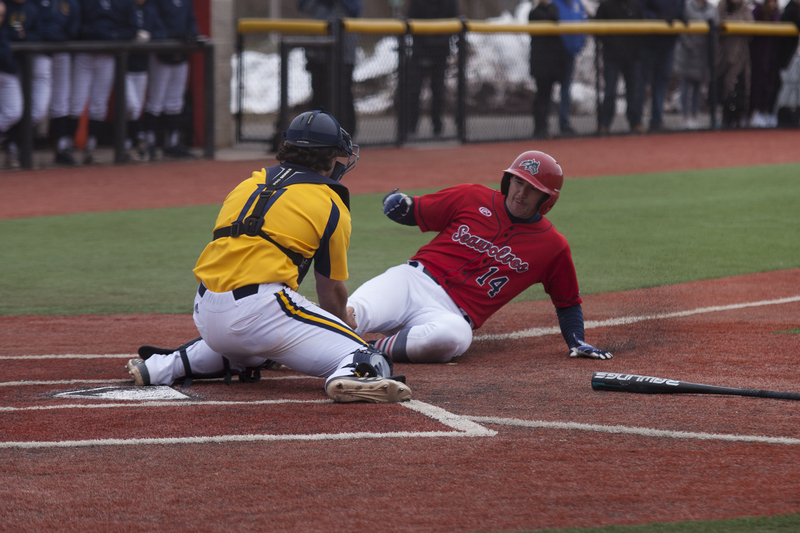 Stony Brook had an ugly performance on Saturday in the second game of the series. Things got out of hand in the third inning with the Seawolves leading 2-1. The Great Danes’ offense surged for nine runs on just six hits, knocking junior starting pitcher Bret Clarke out of the inning without recording an out. Clarke’s eight runs against were twice as many as he had allowed in any game this season and led to his shortest outing of the year. Albany continued to batter Stony Brook’s pitching after Clarke exited the game, scoring six more runs in the bottom of the third off senior pitcher Teddy Rodliff. The entire lineup produced offense, as every starter recorded at least one RBI. Incredibly, Stony Brook recorded the same amount of extra base hits as Albany with six apiece, and the only home run was hit by Stony Brook’s senior outfielder Andruw Gazzola. Stony Brook briefly held a lead in this match, jumping on top in the second inning. Senior infielder Bobby Honeyman led off the inning with a triple to right center and scored on a single from Hamilton in the next at-bat. Stony Brook surrendered the lead in the bottom of the second, but regained it on Gazzola’s solo shot to lead off the third inning. The finale of the series on Saturday was a close, seven-inning affair. The Seawolves got on top in the first inning, working two consecutive one-out walks and moving the runners into scoring position on a Honeyman groundout. Junior designated hitter Michael Russell delivered a single to center field, scoring the pair and putting the Seawolves on top 2-0. Redshirt-sophomore starting pitcher Greg Marino cruised through the first inning but got into a jam in the second. Codispoti reached first base on an error to start the inning, and Lagravinese singled to right field to put the runner in scoring position. Freshman infielder Ryan Hernandez singled through the left side to load the bases, and freshman infielder Brad Malm lifted a sacrifice fly to right field, scoring Codispoti. Sophomore infielder Nick Kondo doubled in the next at-bat to score Lagravinese and tie the game, and Hernandez scored on a wild pitch two batters later to give Albany the lead. The Seawolves failed to create any more offense until the seventh inning. Down to their last out, Gazzola laced a single to right field to keep the game alive. Wilson extended the game with a double to center in the next at-bat, scoring Gazzola and ensuring there would be at least another half-inning. The Seawolves got another runner on base, but ultimately stranded the go-ahead run. Senior closing pitcher Aaron Pinto had already thrown two innings in relief of Marino, but went out to pitch the bottom of the seventh. It proved to be one inning too many, as Albany loaded the bases on three consecutive singles. Redshirt-senior outfielder Connor Powers lined a single off Pinto to bring home the winning run, and secure the 4-3 walk-off victory. The losses drop Stony Brook to 19-15 overall and 6-6 in conference play, falling from first to third place in the America East standings. Stony Brook will continue its road trip with a game against Iona on Tuesday, April 17 before returning home for a weekend series against UMBC. Stony Brook leads the season series against Iona 2-1 after defeating the Gaels at home 5-2 on April 10.